“I honestly didn’t think that was a possibility,” Mahan said after holing a 20-foot birdie putt on the 18th for a 66. Hunter Mahan hits his approach shot on the 17th hole during the third round of the Tour Championship golf tournament at East Lake. THE CUP IS close enough now for Hunter Mahan and Aaron Baddeley to seriously consider how much it’s worth to them. Even if they’re not thinking about the same cup. “That’s a huge goal of mine, to make that team and play down in Melbourne,” Baddeley said. Now he’s got 10 million things to think about. Of the top five players in the FedEx Cup, only Luke Donald remains in serious contention. That means Mahan has a shot at the FedEx Cup and its $10 million bonus if he were to win the Tour Championship (and its paltry $1.44 million payoff). Mahan and Baddeley were at 9-under 201. Jason Day recovered from a ragged start and had a 69, leaving him only two shots back. The 23-year-old Australian was tied with K.J. Choi, who also started poorly and shot 70. Donald, the world No. 1 who still can add his name to the prestigious list of players to have captured the FedEx Cup, had a 70 and was only three shots behind. Bill Haas, who had a chance to make the Presidents Cup team last week until a 42 on the back nine at Cog Hill, was among those tied for the lead until the final two holes. He went bunker-to-bunker on the 17th and had to scramble for bogey, and then hit his tee shot on the 18th into the crowd, missed a 4-foot putt and made double bogey. Haas was followed by his father, Jay Haas, an assistant captain for the Presidents Cup. He had to settle for a 69 and was so steamed that he refused requests for interviews. Ten players were separated by five shots — the margin by which Baddeley trailed going into the third round — and the group includes Phil Mickelson, who won this event two years ago. He had a 67 and was only four shots behind. The pressure is building on so many fronts going into Sunday, and while it’s easy to focus on the $10 million to the winner of the FedEx Cup — $9 million of that in cash — for some it’s a cup that doesn’t pay anything. Baddeley, a winner at Riviera early in the year, grew up in Melbourne and desperately wants to be part of his first Presidents Cup team at Royal Melbourne. He is among three Australians — Robert Allenby and John Senden are the others —under consideration for two of Norman’s picks. They will be announced Tuesday. Baddeley spoke to Norman at the start of the week and knew the Shark would be watching. It didn’t make Baddeley nervous, it made him determined. Most of that practice time was spent on putting. 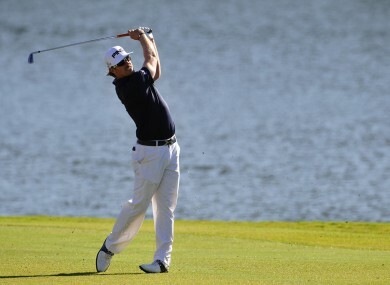 Baddeley is among the best in golf, though he felt something was missing. He worked on getting the club more balanced, paying particular attention to his right hand on the putter. He seems to have figured it out, making a 35-foot putt on No. 7, and a pair of 20-footers on the 14th and 15th. The rest of his game was sharp, too. From 176 yards in a fairway bunker on the 13th, he stuffed a 7-iron to inside 10 feet for yet another birdie. Mahan also got in some late practice, mainly trying to get the club more square at impact because of a change in his release since working with Sean Foley. He got into the picture by hitting his approach on the eighth to inside a foot, and then drilling a fairway metal from 274 yards to 20 feet for an eagle on No. 9. Throughout the day, the projections for who might win the FedEx Cup were like watching the stock market. As many as five players moved to the top, although nothing really matters until Sunday. Webb Simpson is No. 1 on the list, and he finished with a birdie on the 18th to get into a tie for 15th. If he were to finish in the top 12, he could still claim the $10 million even if Mahan wins the Tour Championship. Adam Scott remains hopeful, at least of the Tour Championship. He was in the lead until a 39 on the back nine, compounded by a three-putt double bogey on the 14th. He wound up with a 74 and was five shots behind. Email “Baddeley, Mahan tied for the lead at East Lake”. Feedback on “Baddeley, Mahan tied for the lead at East Lake”.